The water is drawn from an underground aquifer and is a trace bit low on iron. Leslie Treece, who drives by the Schiller Woods pump weekly. Larry Powers, who's been curious about the water pump for over 40 years. The particular well, known as the Fountain of Youth, is just west of the model airplane flying field in Schiller Woods Forest Preserve. Editor&apos;s note: The radio story about the Schiller Woods water pump begins at 8 minutes and 40 seconds in this audio file above. 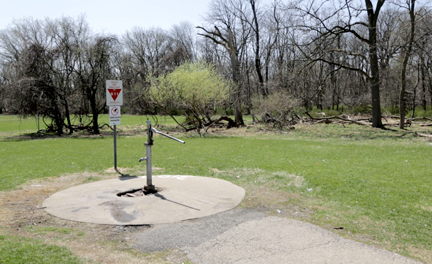 Curious City recently got two very similar questions about a peculiar pump in the Schiller Woods Forest Preserve, about one mile east of Chicago’s O’Hare International Airport. Larry Powers, 70, also sees people flocking to the pump on West Irving Park Road while he’s traveling from his home in Oak Park to play handball in Des Plaines. 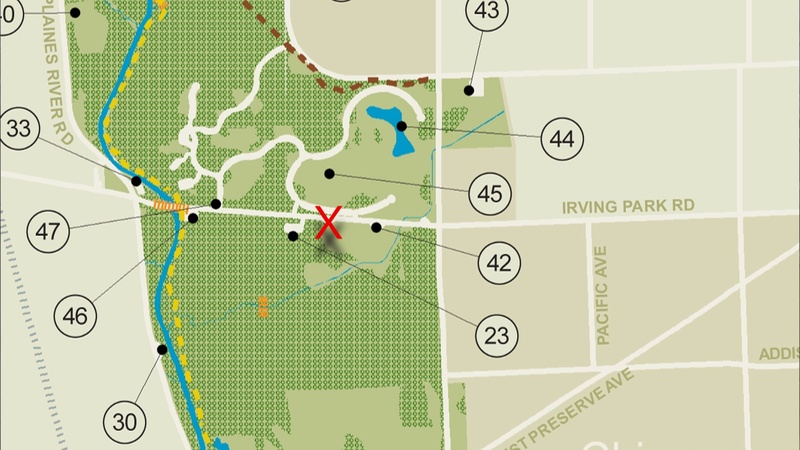 What’s so special about the water in Schiller Woods? When we first met Leslie and Larry, neither had tried the water, but neither had they had the opportunity to hear directly from people who draw from the pump. 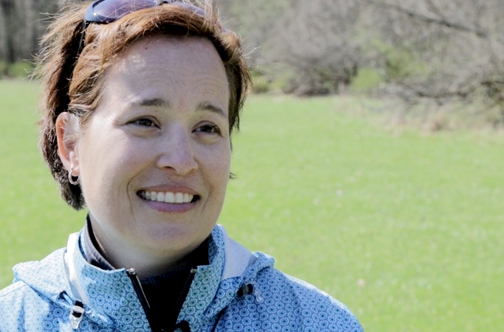 We brought the two together for a video shoot to face the pump and the hard truth: that the answer to whether there’s something special in the park’s well water depends on who you ask. From the perspective of the Forest Preserve District of Cook County, it’s certainly their most popular pump. In fact, FPDCC Maintenance Supervisor Len Dufkis said they have to repair the creaky metal apparatus every year, or about ten times more often than the rest of district’s 212 water pumps. Its allure goes back to 1945, when the pump was first installed. “There’s many myths, legends, stories — that this is holy water, this has medicinal qualities to it — you name it, people have said it,” Dufkis said. If, as some people claim, the pump taps into a fountain of youth, it’s of the Indiana Jones and the Last Crusade variety; the pump itself is nondescript, even a little shoddy-looking. Its metal piping rises about four feet out of the ground, a long handle protruding out towards the paved walkway that connects it to Irving Park Road. Its piston rattles and squeaks as it pumps clear water from a spigot a few feet off the ground. So what’s special about it, chemically? The water, which comes from an aquifer that begins some 31 feet below ground, is very hard — about 19 grains per gallon, according to a free testing service at Home Depot. That means its mineral content is off the charts compared to tap water, but it’s typical for well water. 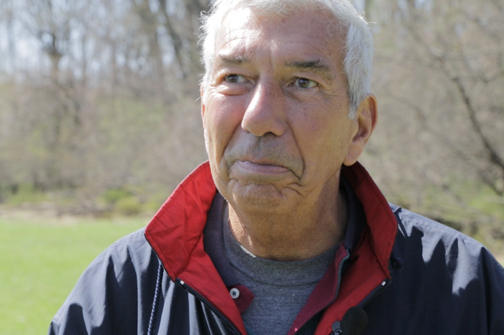 Len Dufkis, who maintains the Forest Preserve’s pumps, said the Illinois Department of Public Health tests the water every six months for potentially harmful bacteria, but they don&apos;t delve into its chemical profile. Ten years ago, however, the Forest Preserve did. They found an unusually low iron content in this particular water, which may distinguish it from similar groundwater. But it still doesn’t explain why just across the street another pump that draws from the same aquifer fails to draw the crowds. No matter the weather or time of day, it seems, someone is crouched at the pump, collecting water from the spout. “I’ve lived here since 1972, and since then that pump is constantly in use, no matter what the weather,” said Larry Szlendak, 64, who moved to the nearby village of Harwood Heights from Bialystok, Poland. He started drinking Schiller Woods a few years later. Szlendak said the water’s mineral taste reminds him of well water he’s had in Colorado and in his native Poland. He speculates that might be why many evangelists of Schiller Woods water were born in Eastern Europe, Latin America, or other regions where well water is more common. Neil Parker, who grew up in suburban Detroit, also pegged the taste to childhood memories of feeling close to the land. Its use remains controversial among some communities, however, and several European countries have stopped fluorides under public pressure. Several of the people I talked to at the Schiller Woods pump cited its lack of fluoride as a major motivation for their stockpile of water cooler jugs. Word travels fast among well water drinkers, so most people learn about the pump via personal recommendation. But in addition to that online following, the pump also fosters a tangible sense of community. Polish-born Elizabeth Osika said she’s made many friends while waiting in line for Schiller Woods water. The man, who gave his name only as Rajmund, said he moved to Chicago from Poland 15 years ago and started drinking Schiller Woods spring water soon after. Rajmund said he’s seen truck drivers stop off to fill up water bottles for the road. Question asker Leslie Treece filled up a bottle, too, before driving off. With her husband John, Leslie said they used to tease their son Jack Gitschlag, saying the water could cure his sunburns. Larry Powers, who also asked us about the water, was similarly impressed. Having tried the water, our question askers aren’t sold on its youth-giving properties. But they do like the taste.